Sign up for this 9-day motorbiking tour of Ladakh and explore the land of high passes with an off-beat itinerary. You'll visit the famed lakes of Pangong and Tso Moriri, travel to the sand dunes of Hunder, ride through the high-altitude pass of Khardung-La, visit the historic monasteries of Thiksey and Diskit, apart from a range of other exciting adventures. A major highlight of this itinerary, you'll also visit the distant village of Hanle, near the Indo-Tibetan border. With powerful Royal Enfield motorbikes on hand, you'll roar through cold, desert kingdom of Ladakh, with an entourage of like-minded motorbikers and an experienced support team. Surrounded by barren and arid hills as far as the eye can see, you'll travel to distant destinations in Ladakh, having new adventures and clicking picture-perfect photos. Please note that price displayed is the per person price for a booking for one motorbike rider and one pillion rider. Please note that an additional refundable, security deposit of INR 10,000 per motorbike, not included in the cost displayed, is to be paid directly to the tour operator. Ladakh, the land of high mountain passes, is also the land of extraordinary beauty. The Ladakhi terrain, flanked by the towering mountains of the Trans-Himalayan range, with snow-capped summits rising far beyond the clouds, is home to one of the most iconic motorbiking routes in the country. With scenic views of the landscape, painted in differing shades of grey and brown, you'll explore faraway villages and secluded landmarks in the region on a 9-day motorbiking itinerary. Your adventure begins in Leh, the largest city of Ladakh. After exploring the city, you'll travel to the sand dunes of the Nubra Valley and spend a night by the famous Pangong Lake. A highlight of this itinerary, you'll also visit the distant village of Hanle and the multi-coloured Tso Moriri. Riding via the historic town of Kargil, you'll travel to the state capital of Srinagar, ending the tour with unforgettable experiences. • Sign up for an adventure on one of India's most legendary motorbiking routes. • Visit little-known villages like Hanle and camp by the Tso Moriri. • Spend a night in Swiss tents by the multi-coloured Pangong Lake. • Get absolutely stunning views of mountains and hills in the Ladakhi range. 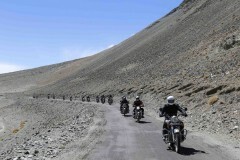 Travellers are required to follow all instructions of the road captain during the Ladakh motorbiking trip. 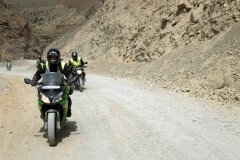 The tour operator reserves the right to alter or cancel the itinerary of this Ladakh motorbiking trip due to any unforeseen circumstances to ensure maximum safety of travellers and staff. Costs arising due to such a change in itinerary will be borne by the traveller. There is no pick-up for this Ladakh motorbiking trip. There is no drop-off for this Ladakh motorbiking trip. Arrive in Leh and convene at a pre-determined meeting point. In the afternoon, you'll meet your fellow motorbikers and your road captain for a brief orientation session to discuss the climate conditions, itinerary and other details of your upcoming motorbiking adventure. In the evening, test ride your allotted motorbikes in the streets of Leh. Overnight in a hotel at Leh. Begin your Ladakh motorbiking tour by taking on the challenge of riding through the world's highest mountain pass, the Khardung-La, at an altitude of over 17,000 feet on today's journey to Hunder. Located in the Nubra Valley, Hunder is famous for sprawling sand dunes and the Bactrian double-humped camels. Enjoy a scenic evening at Hunder and visit the nearby Diskit Monastery. Overnight in Swiss tents or a hotel at Hunder. In the morning, spend some time on the banks of the Pangong Lake and visit the area featured in the popular Bollywood movie '3 Idiots'. Soon, you'll travel back from Pangong and continue to Hanle, a little-known village close to the Indo-Tibetan border. After crossing a few high-altitude villages, you'll ride through the Rezang-La and Tsaga-La, mountain passes that were once battlefields during the Indo-Chinese wars. At Hanle, you can visit the local monastery and spend some time at the astronomical observatory in the village. Overnight in a hotel at Hanle. Travelling back from Hanle, you'll ride to the Tso Moriri Lake, another gorgeous high-altitude lake in Ladakh. The clear and beautiful skies offer a stunning backdrop for mountain peaks on the way to Tso Moriri. Stop at vantage points to click photos and admire the scenery. Overnight in Swiss tents at Tso Moriri. Return to Leh from Tso Moriri. You'll ride through a relatively, less travelled route, with open and vacant areas. Mountains of the Changthang valley will keep you company through until you arrive in Leh. Overnight in a hotel at Leh. Continuing forward from Leh, you'll take a turn west to reach the town of Kargil, an strategic and historic town in Ladakh. En route, you'll stop at the Magnetic Hill and visit the Pathar Sahib Gurudwara, an important Sikh house of worship. You'll also stop by Moonland, site where several Bollywood songs were filmed. Overnight in a hotel at Kargil. Head west on the Srinagar-Leh highway and ride through the tricky turns of the Zojila Pass and cross the village of Drass, the second-coldest inhabited village in the world. You'll also halt to visit the Kargil War memorial, dedicated to the soldiers of the 1999 Indo-Pak war. Driving past Sonmarg, you'll arrive in Srinagar, where you'll return your allotted motorbikes. Your trip ends here. Arrive in Leh. You'll be accommodated in a hotel at Leh. Today's meal package includes dinner only. In the evening, you can visit the local marketplace in Leh to shop for any last minute essentials. Spend the day at Leh. You'll be accommodated in a hotel at Leh. All accommodation units throughout the trip, including the Swiss tents, will come with attached washrooms. Today's meal package includes breakfast and dinner only. 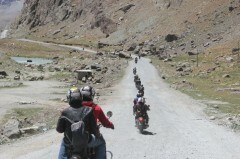 Ride from Leh to Hunder. You'll be accommodated in Swiss tents or a hotel at Hunder. Today's meal package includes breakfast and dinner only. Ride from Hunder to Pangong Lake. You'll be accommodated in Swiss tents at Pangong Lake. Today's meal package includes breakfast and dinner only. Overnight in a hotel at Hanle. Ride from Pangong Lake to Hanle. A support vehicle driven by a mechanic will follow your entourage throughout the trip. You'll be accommodated in a hotel at Hanle. Today's meal package includes breakfast and dinner only. Overnight in Swiss tents at Tso Moriri. Ride from Hanle to Tso Moriri. A road captain riding on a motorbike will lead your entourage throughout the trip. You'll be accommodated in Swiss tents at Tso Moriri. Today's meal package includes breakfast and dinner only. 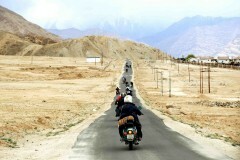 Ride from Tso Moriri to Leh. You'll be accommodated in a hotel at Leh. Today's meal package includes breakfast and dinner only. Please note that non-vegetarian food may not always be available everywhere. Ride from Leh to Kargil. You'll be accommodated in a hotel at Kargil. Today's meal package includes breakfast and dinner only. Please note that due to the high-altitude, there may be limited road access and availability of services like cellular network or bank ATMs. Ride from Kargil to Srinagar. Today's meal package includes breakfast only. Return your allotted motorbikes at Srinagar. Your trip ends here. There is no pick-up for this Ladakh motorbiking trip. You begin motorbiking from Leh itself. Leh is easily accessible by road or air, from most domestic and international hubs. You can board a connecting flight from Delhi to Leh's Rimpochee Airport from most major cities in India.